This page notifies recent additions and changes to events – both our own and selected external events. To keep up to date, you should also check the Notices page, where other news is reported. Celebrating 2,000 years of the history of the city. Saturday 15th June 2019 at St Nicholas Priory, Exeter from 10 am to 4 pm. 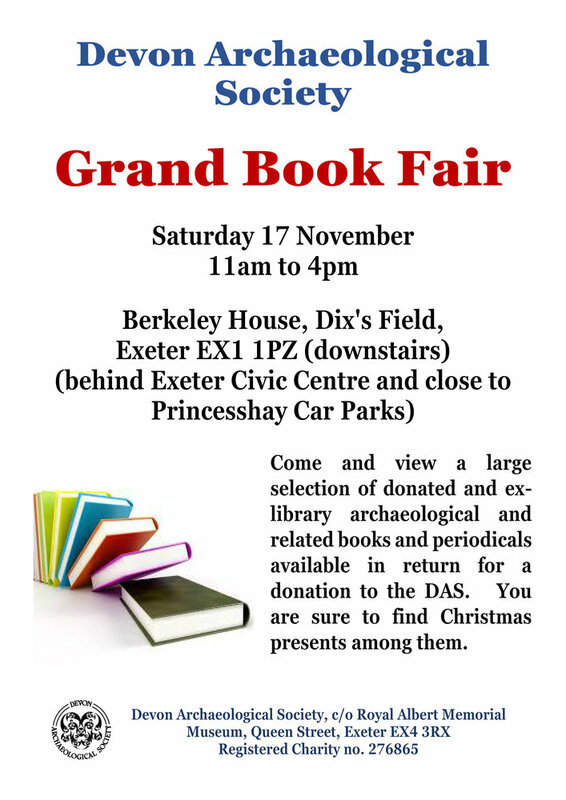 Our Exeter Branch will be one of the exhibitors. Click on the poster to see the full details. 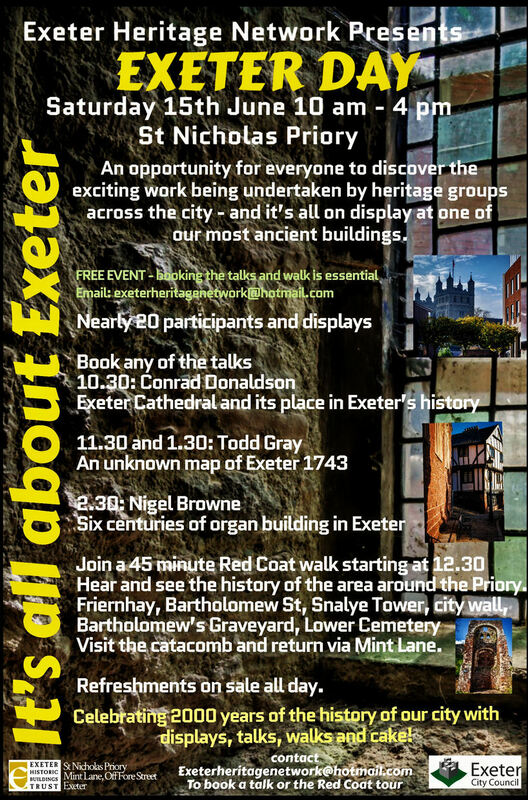 Saturday 11th May 2019 at St Stephen’s Church, High Street, Exeter from 10 am to 4 pm. The History Section visit to Kents Cavern that was advertised as taking place on 15 May will now take place on 8 May from 1 pm. The following events have been postponed due to the snow that’s currently affecting Devon. Our Botany Section has postponed its AGM planned for Sat 2 Feb. Watch this space or the Section’s list of events for details of the rescheduled event. Our Music Section postponed its AGM that was planned for Thursday 31 Jan. Watch this space or the Section’s list of events for details of the rescheduled event. Our East Devon Branch has published its report for the last six months, here. Also, details of all the events that the Branch has arranged for the coming year can now be seen here. Plymouth, Tavistock and Exeter Branches have now published their six-monthly reports. Our History Section has advised details of its events for the coming year, here. Please note that the venue for our Music Section’s Romani Gipsy Music event on 1 March has changed from Great Torrington to Barnstaple. Full details are not yet available, but the event page is here. The Section has recently arranged another event for July – see the details here. Our Exeter Branch has posted its list of events for 2019. See here. 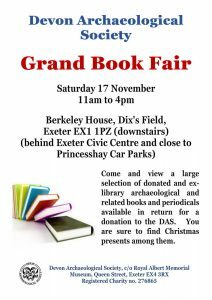 The Devon Archaeological Society is holding a Grand Book Fair at its premises in Berkeley House on Saturday 17 November. Hundreds of new publications, donated and ex-library books and journals on archaeological and related subjects will be available in return for a donation to the society. The Devon Archaeological Society is celebrating its 90th anniversary in 2018-19. Membership is open to everybody and full details of this, together with information about the upcoming Anniversary programme of events, can be found on its website. The Geology Section’s AGM on 19 January 2019 at Torquay Museum was inadvertently omitted from the printed diary included in the autumn issue of DA News. Details of the event are shown here. The Dartmoor Tinworking Research Group (DTRG) Autumn Social Walk 2018. A tour of the Brookwood Mine site guided by Phil Newman, followed by a Social and talks at the Dartmoor Lodge. For full details see “Diary Dates” on the DTRG website. Golden Anniversary celebration on Saturday, 13th October 2018 at Glenorchy Church and Hall, Exmouth. Click here to see full details and a booking form. This annual conference is being hosted this year by the Dartmoor Preservation Association and will be held at the Two Bridges Hotel on Dartmoor from 4 to 6 October. The title is “What value our National Parks?”. The middle day, Friday 5 October, will be a “conference within a conference”, open to all comers and a group of ten wonderful speakers has been assembled to entertain and inform on subjects which are of national and local importance to anyone who cares about our National Parks. Full details and booking instructions are on the DPA’s website here. Wren Music will hold its 20th annual Baring-Gould Folk Festival in Okehampton from Friday 26th to Sunday 28th October 2018. The event is preceded by a five-day Folk Song School led by folk singer Chris Coe. Paul Wilson of Wren Music is the chair of our Music Section, and he and Marilyn Tucker provided much of the musical content for our Devon–Newfoundland Story Celebrations that were held in April 2017. A series of field trips over three days from 17 September, visiting World Heritage sites in the Hayle area. Including Carnbrea, Wheals Frances and Basset, Hayle town and its estuary, Portreath, Cligga Head and the explosive works. See the event details here. You can see the very varied programme here. Starting in September there are talks about Devon’s newest mine, intertidal life, Dartmoor’s archaeology, the medieval longbow, the rebuilding work on Castle Drogo, and the Duke of Bedford’s ancestors (“Mad, bad and fascinating to know”). Also a social evening with a talk about Nepal, and the Branch AGM. Wow! We are sorry that this event has had to be cancelled: the site has become too overgrown! See the event page for the proposal to reschedule. This Buildings Section event has had to be cancelled due to unforeseen circumstances. The date for this Bideford Branch event has been changed from 18 May to Friday 15 June. The corrected details are here. The date for this IA event was shown wrongly as Tuesday 17 April. The correct date is Thursday 17 May. The corrected details are here. 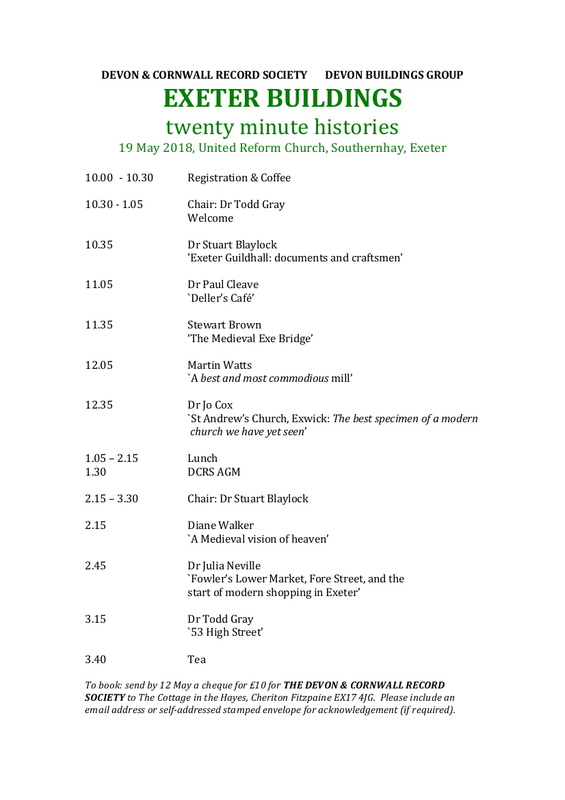 Unfortunately the date for this History Section event was shown wrongly as 19 September. It takes place on 11 September. See the full details here. Historian and broadcaster Stephen Baxter will be giving a public lecture in Exeter Cathedral on the results of the major research project on the Exon Domesday at 7.15 pm on Tuesday 17 April. Admission is free, but by ticket only. See the website for details. Members of the research team will be on hand from 3 to 5 pm to explain how to use Domesday Book, to talk about their work and to take questions from the public and to demonstrate the features of their new website. DA members may recall a talk on this topic that was given by Professor Julia Crick at our 2016 Symposium. Plymouth Branch has had to cancel its planned talk for 11 April by Edward Luscombe entitled “The Picture of Plymouth, 1812”. It is hoped to reschedule the event. 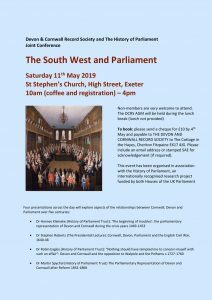 The Devon and Cornwall Record Society in association with the Devon Buildings Group have an event – incorporating the DCRS’s AGM – on 19 May at the United Reform Church, Southernhay, Exeter. Click on the image to see the full programme. The Entomology Section’s events for this year are now available here. The Geology Section had to cancel its talk on Saturday 3 March in Teignmouth due to the bad weather. It has now been re-scheduled for Saturday 9 June. Details here. Unfortunately the Geology Section’s field trip to the Fforest Fawr Geopark that was planned for 27–29 April has had to be cancelled due to insufficient bookings. Devon History Society invites bookings for its Spring Conference ‘How the Vote was Won: Women’s Suffrage, Devon and the Representation of the People Act’. 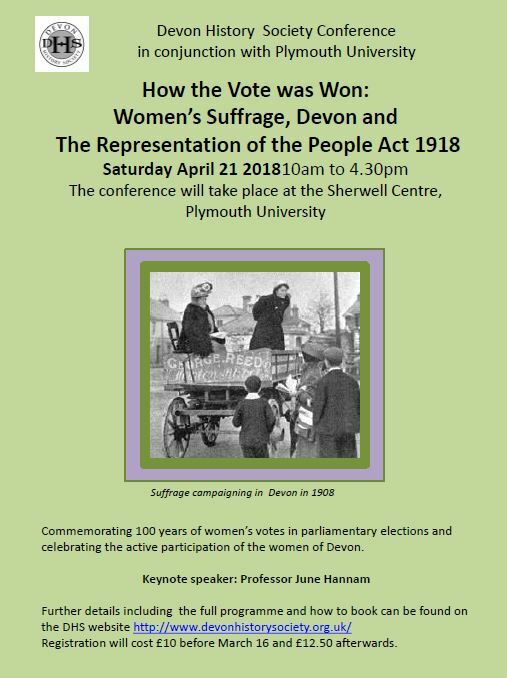 The conference, which features presentations about women active in the movement across the county, takes place on Saturday April 21st at the University of Plymouth. For more information see www.devonhistorysociety.org.uk. There are Early Bird discounts on bookings made by March 16th. Tickets are £4 for each lecture and booking is essential – full details are on Exeter Local History Society’s website here. 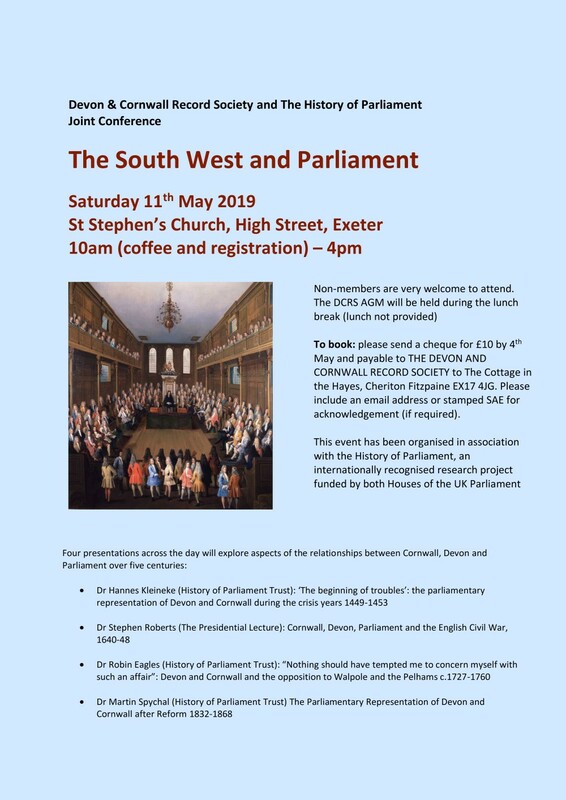 The Devon & Cornwall Record Society will present a celebration of the archival work in Devon of DA’s former president, Dr Tom Greeves, in conversation with Dr Todd Gray. At Exeter Guildhall, Saturday 10 March 2018 2–3 pm. See the flyer for further details. As the Museum of Barnstaple and North Devon closes temporarily for its Long Bridge Wing Extension Project, it launches a pop-up museum at Bridge Chambers on the Strand. See the poster for details of the launch event on 14 February from 11am to 4pm. The time of Exeter Branch’s event on 7 Feb: “Landscape Gardens and F. W. Meyer” has had to be changed from 2.30 to 3.00 pm. The event details are here. The Buildings Section’s extensive 2018 programme is now on-line. The list of upcoming events is here. Just added the Geology Section’s events for 2018 – five field trips and two lectures. See the details here. East Devon Branch has announced its events programme for 2018. See the details here. Bideford Branch has changed the date of its talk “Conservation in Exmoor National Park” from 16 to 9 February. The other details remain unchanged. The Literature and Art Section has announced its events programme for 2018. See the details here. 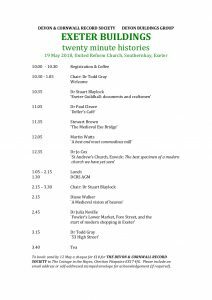 Exeter Branch has posted its events list for 2018. The year starts with a party which includes an amusing talk by Dr Sue Knox about Haldon Belvedere. This is followed in February by a talk on F. W. Meyer, a landscape gardener working in the Westcountry in the late Victorian era. Subsequent talks are on Roman Exeter and the Seaton Down Hoard in March, and Exeter’s Cathedral Yard fire in April. In May a visit to Ashley Court near Tiverton has been arranged, followed in July by an excursion to Tiverton Castle and an August walk along Dawlish seafront to learn about its geology and the development of the town. The year draws to a close with the Branch Annual Lunch in September and the AGM in November. An external event: The Cathedral Yard Fire, Exeter, 2016–2017 will take place in Exeter Guildhall on 20 November. It has been necessary to make changes to the dates of several Bideford Branch events. The Branch events list shows the up-to-date position. The events shown on this website should now be the same as those that will soon be published in the DA Events Diary. Remember that even after the printed Events Diary has been distributed, Branches and Sections can have any details of their events updated on this site by contacting the webmaster. All events notified to the Registrar by 24 August have now been added (up to next year’s Conference in June). The date of the Geology Section trip to Dartmouth to see the college and some local geology has had to be changed to Thursday 27th July.